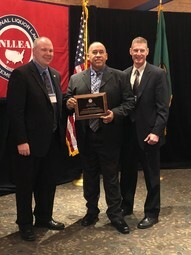 In a letter to ABRA, NLLEA President, Justin Nordham said that ABRA was the "ideal recipient" for the award, chosen for its "effectiveness in coordinating a comprehensive plan to create a well-regulated environment in the District Wharf along with enforcement strategies designed to protect public safety during multiple large events...and multi-agency collaboration." nation’s capital as events unfolded.This was all achieved with great transparency, as the agency constantly communicated its programs and decisions with licensees, the media and the community to great acclaim. ABRA has previously received two NLLEA awards, but never for Agency of the Year. In 2009, ABRA was recognized for its special licensing, education and enforcement initiatives during the 56th Presidential Inauguration and in 2017, it received the Program of the Year award for DC: Double Check 101. 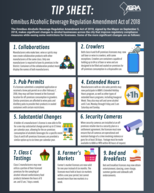 The Omnibus Alcoholic Beverage Regulation Amendment Act of 2018, became District law on Tuesday, Oct. 30. The bill makes significant changes to alcohol businesses across the city that improves regulatory compliance measures while easing some restrictions for many ABC licensees. The bill provides additional business opportunities for District alcohol manufacturers including allowing manufacturers who create beer, wine or spirits to create and sell collaboration products with other alcohol manufacturers; allowing manufacturers to sell and deliver alcohol produced at their licensed establishment over the internet directly to homes in the District; authorizing manufacturers to participate in The Alcoholic Beverage Regulation Administration’s (ABRA) Extended Holiday Hours; and allowing off-premises retailer licenses, class A and B to sell beer and wine in crowlers. In order to help licensees understand some of the changes to the law, ABRA has published a "tip sheet" that provides a brief overview of some of the more prominent changes. For the full details on each of these proposed changes and others, please review the Omnibus bill in its entirety. Under the District's Extended Holiday Hours program, 207 restaurants, bars, nightclubs and hotels are registered to sell and serve alcohol until 4 a.m. on the night of Dec. 31, for the New Year's Day holiday. Licensees registered for the program must end alcohol service by 4 a.m. the morning of New Year's Day unless an enrolled establishment is required by the Alcoholic Beverage Regulation Administration (ABRA) to close earlier. Click here for a list of registered establishments and an interactive map of where they are located. There is still time for establishments to sign up for the New Year’s Day holiday extended hours, prior to the Monday, December 3, 2018 deadline. An on-premises licensee that is interested in participating in the program can apply by submitting a registration form at least 30 days prior to the first holiday an applicant wants to participate in. Once a licensee is registered for the program, the establishment is eligible to participate each year thereafter. Licensees with settlement agreements or Board orders restricting closing hours may not be eligible to participate. All pub crawl licenses issued in 2018 expire on Dec. 31, 2018. Promoters and organizers that are planning to host pub crawls in 2019 need to apply for a new 2019 pub crawl license and ensure hours of operation permit participation. A pub crawl license application needs to be submitted to the Alcoholic Beverage Regulation Administration (ABRA) at least 60 days prior to an initial pub crawl event. Applicants must also pay a fee of $500 for the license, which is only valid for the calendar year that it is issued. A promoter or organizer that has an event proposed for early 2019 is strongly encouraged to submit the application as soon as possible. Applications are subject to the approval of the Alcoholic Beverage Control Board. The Alcoholic Beverage Control Board (Board) will be on recess Wednesday, Nov.21, Dec.19, Dec. 26 and Jan. 2. ABRA's office will remain open and operate while the Board is on recess. The Board will reconvene on Wednesday, Nov. 28 and Jan. 9. ABRA has added a number of new Licensee Orientation Trainings to its schedule this year. All new and existing licensees throughout the District are invited to attend. The next training will be held from 2-4 p.m. on Thursday, Dec. 13, 2018. Register online or contact ABRA Community Resource Officer Sarah Fashbaugh by Friday, Dec. 7, 2018 by emailing or calling (202) 397-3971. All trainings are located at ABRA's office at 2000 14th St., NW, Suite 400 South, 4th Floor, Washington, DC 20009. The Alcoholic Beverage Regulation Administration's (ABRA) office will be closed on Thursday, Nov. 22 and Friday, Nov. 23 for the Thanksgiving Holiday. In addition, the Alcoholic Beverage Control Board (Board) will be on recess on Nov. 21. The Board will reconvene on Wednesday, Nov. 28, 2018.